UPDATED, Sept. 27, 3:14 p.m.: Another downtown Brooklyn development is facing opposition. This time, it’s Slate Property Group’s proposed 40-story tower on Fulton Street, the Brooklyn Paper reported. Community Board 2 has criticized the planned project, which requires the site to be upzoned — and is currently moving through the city’s Uniform Land Use Review process. 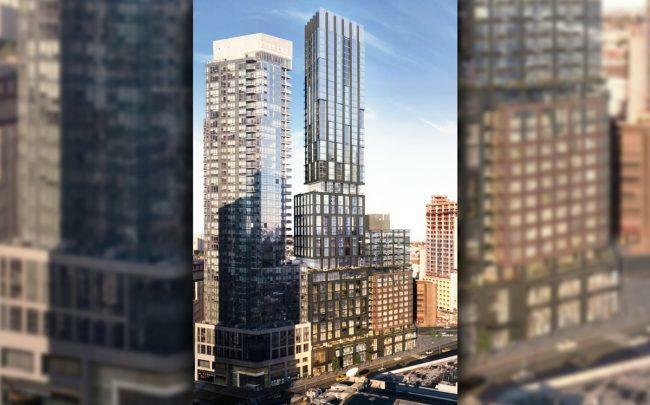 Plans call for a 558-foot mixed-use tower at 570 Fulton Street with 139 apartments, about 40 of which will be below market rate. The nearby Ingersoll Houses Tenants Association said the project would be a boost for necessary affordable housing in the area.